One of the great iconic images of English literature is from John Bunyan’s Pilgrim’s Progress: the protagonist, Christian, finally drops his great burden at the Cross. 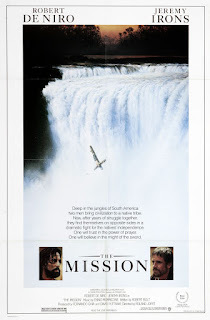 That image is reimagined in the 1986 film, The Mission. 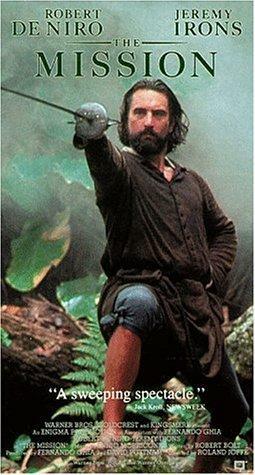 The film is set the 1740’s in the jungles of South America, and in the role of Christian is Rodrigo Mendoza (Robert De Niro), a mercenary working for slavers. When Rodrigo kills his brother but isn’t criminally prosecuted, he is wracked with guilt. (His brother is played by Adrian Quinn, so apparently killing the star of Reckless is not considered a crime.) Rodrigo’s suicidal guilt leads him to Jesuit missionary priest Father Gabriel (Jeremy Irons). Gabriel loads Rodrigo’s own armor and weapons onto the man’s back and, with him, hikes into the jungles. They eventually climb up the Iguazu Falls (on the border between Argentina and Brazil). Other Jesuit priests argue it is too much, but Rodrigo doesn’t think so -- so neither does Gabriel (“How long must he carry the burden?” a priest asks. “God knows,” Gabriel replies). No one is allowed to cut off the burden, until Rodrigo reaches the top of the falls. And then, the indigenous people whom Rodrigo had enslaved are the ones who cut the burden from his back. It’s a powerful scene, encapsulating together repentance and grace. The film is full of beautiful images and thoughtful dialogue that deal with complex issues of religion, politics, and culture. The film took the highest prize (the Palme d'Or) at the Cannes Film Festival and the Oscar for Best Cinematography. Some of the credit goes to the director, Roland Joffé, but even more credit goes to the great screenwriter Robert Bolt (A Man for All Seasons and Lawrence of Arabia) for the original story as well. Bolt takes complex issues and allows them to be complex, allows different positions to be argued well. For instance, he takes on the issue of pacifism and allows for two different Christian perspectives on the issue, as Jesus did when he said both to both to turn the other cheek and to bring a sword. In the third act of the film, the abolitionist government cedes land to the Portuguese, who still profit from making the native South Americans into slaves. The Catholic missionaries are caught in the middle of the political intrigue, and (spoiler) the Catholic hierarchy orders the Jesuits to withdraw from their missions. Neither Rodrigo (now a member of the order) or Father Gabriel are willing to do so. Gabriel decides to stay with the Guarani, the people he’s been working and living among, in their mission, on their land, and with them, to face the Portuguese armies and mercenaries without resistance. Rodrigo decides to resist violently. Rodrigo asks for Father Gabriel’s blessing before he goes to battle. Gabriel refuses, saying, “If you’re right you’ll have God’s blessing. 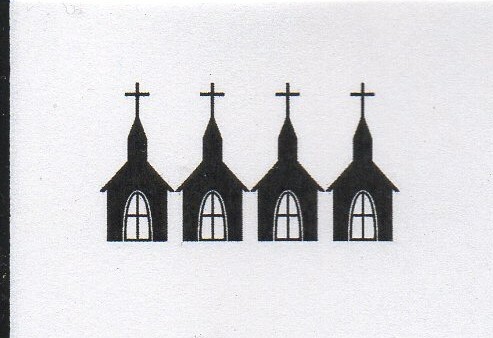 If you’re wrong, my blessing won’t mean anything.” So Rodrigo leads an army and Gabriel leads a choir. From an earthly perspective, both men lose. But perhaps from a heavenly perspective, both men are victorious. If, for this movie, I were rating men like these representatives of the Vatican, I’d have a much lower Steeple rating, but I’m giving Father Gabriel, Rodrigo, the men of the Jesuit order at the mission, and the people of their congregation Four Steeples.